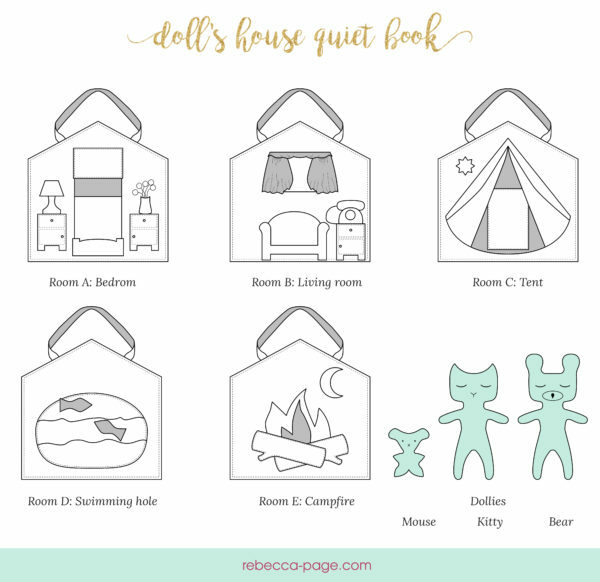 The Dolls House Quiet Book is a quiet book pattern in the form of a dolls house. 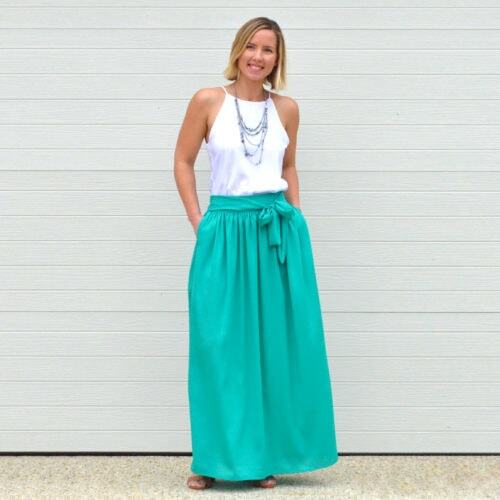 It is a compilation of Pinterest-inspired ideas that seem to be trending lately. Softie Dollies, Take-A-Long Dollhouses, and Quiet Books all seem to pop up in my feed ALL the time. And, with summer road trips and travels under way, what better time for a fun project that is sure to inspire imaginative (not to mention, quiet) play. Fun for the kids, and great for parents’ sanity during long car rides and hotel stays. This fabric book is like a folder that opens out. There is a front and back cover which is the exterior of the house (and the structure of the book), then on the reverse of each of these is the inside of the house. 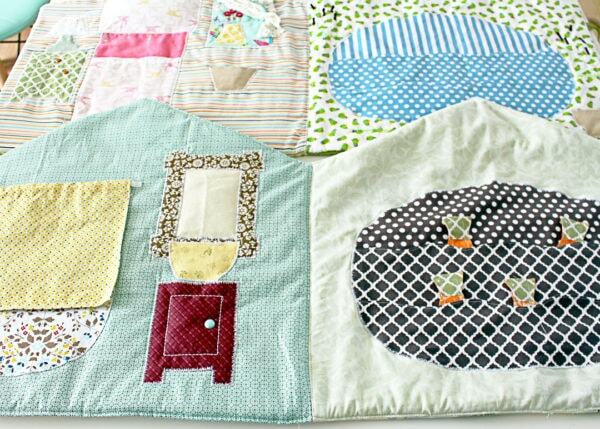 *BONUS* Freebie cut files are included with this pattern! Use with a cutting machine such as a Circuit or Silhouette. Visit our blog for a step-by-step guide on how to make vinyl cut outs without a machine. Options – There are 5 different options for what type of ‘rooms’ you can put on the inside of your house. You need to pick 2 of these and can mix and match any you like for your own look. You could also put a room on the back of the house (the back cover) if you wished. There are also 3 different ‘dollies’ (you need 1, but you could do more if you wanted!). With all these options, you can customise it to be the most phenomenal gift for any boy or girl. This is a great scrap buster and an even better gift! I had so much fun creating this doll house book and the options to create your own pages using pattern pieces already provided and a little imagination are endless! The little one I gifted mine to enjoys it so much! The Quiet Book was a complete labor of love. It’s a wonderful pattern as written, and there are so many opportunities to customize it to make it your own special book. 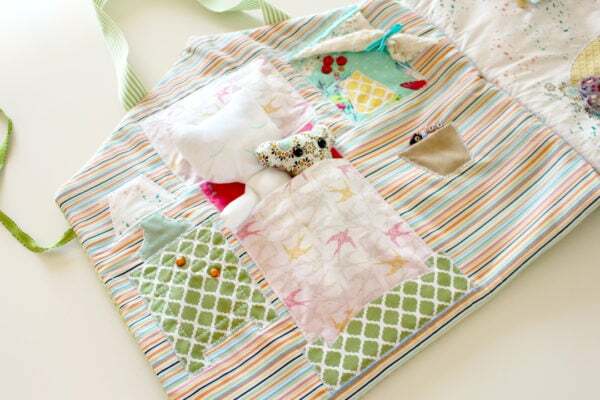 I piled all my fabric scraps in a heap, actually several heaps, on the floor and loved remembering all the things I’d sewn for my grandchildren with those fabrics. The directions in the pattern are terrific, and the designs are so creative. I really, really enjoyed making the Quiet Book. This pattern was very easy to follow. I love all of the options for the pages. It takes a little bit of time to get it done, but it is well worth the work. Set aside lots of time to make the most of this fantastic pattern. The more you embellish, the greater the final product becomes! 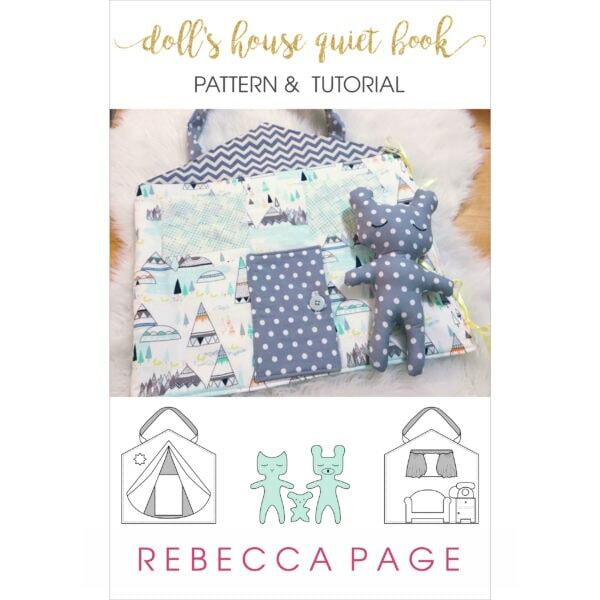 With so many options to be creative with no two Dolls House Quiet Books will be the same so its a perfect handmade gift for all the little people in your life. 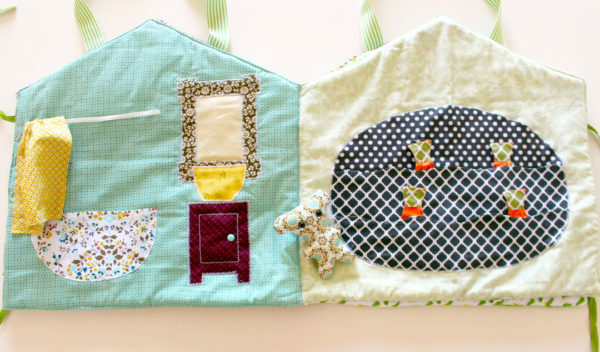 Such a delightful sewing project! I love making something unique and this pattern allows you to do just that and you can let your creativity roam free with adding extra rooms- any of the included 5 – or make up your own rooms! 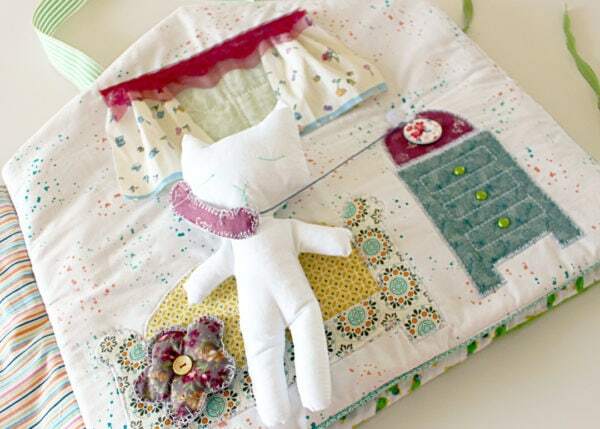 My little girl loves the kitty doll included in the pattern and loves ‘chatting’ on the phone – I included a bit of velcro to the back of the phone headset to keep it in place in the book! Such a clever design which will delight all children and it makes a perfect present for boys and girls alike! 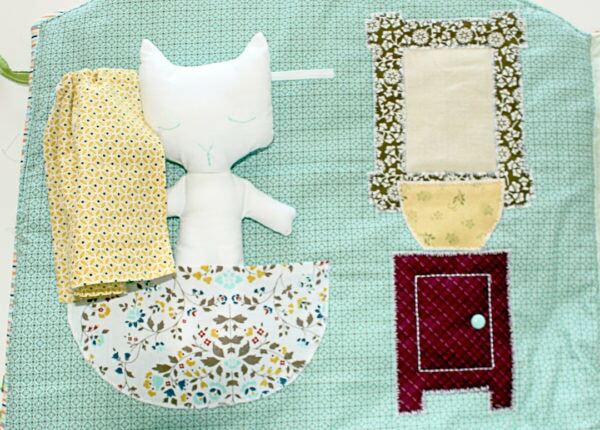 This quilted doll house is the perfect gift for any Toddler in your life AND their parents! The pattern is easy to sew, and has lots of options – you can let your imagination carry you away here. Make it simple to encourage imaginative play, or add many details and activities for them to practice their cognitive skills. Choose between a bear, a kitty, or a mouse that live in the house, or make all three and let them have a party! 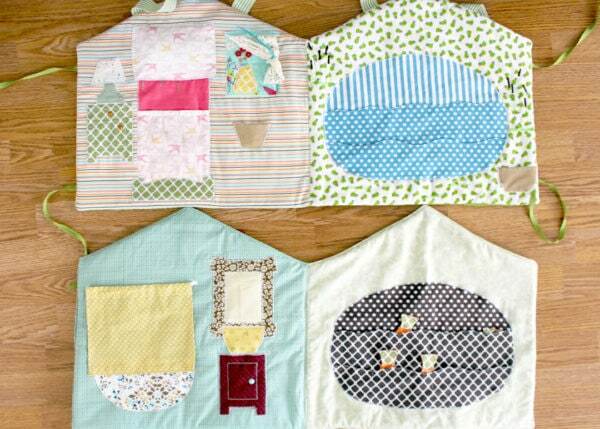 The possibilities are truly endless, and you will want to make one for every child you know! This was one of my first times sewing something that wasn’t a piece of clothing. I loved the options that came with the pattern because they catered to so many! I will say that it was a bit challenging to choose the fabric because I’m such a fabric lover but my kids love the finished product and I’m happy that I was able to step out of the clothing box with such a beautiful pattern! Per norm, the Rebecca Page crew knocked it out the park! This charming quiet book comes loaded with options sure to provide hours of fun imaginary play for your littles. As a bonus, there are endless variations you can add yourself. The sky is the limit! 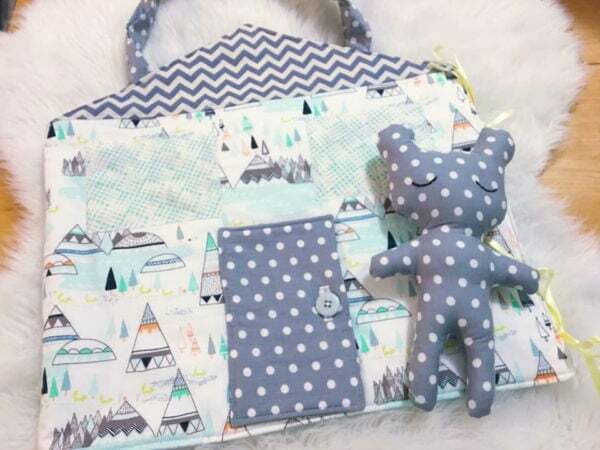 The pattern is well made and organized, and the instructions are clear and easy to follow. This one is a perfect ten for me! Let your creativity flow with this fun pattern. It’s a perfect gift idea and can be made over and over with different variation. 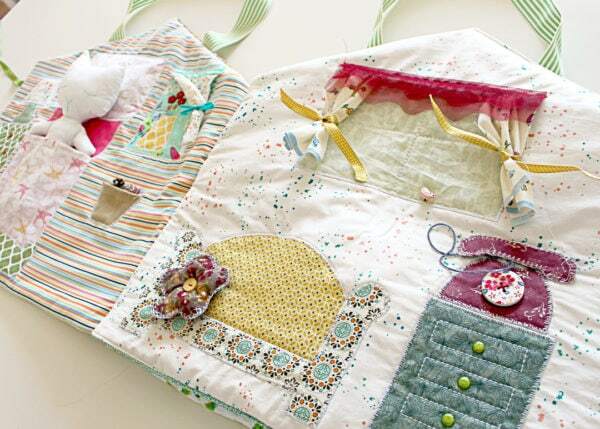 Use the base pattern as your guide and embellish and mix it up to your heart’s content! This pattern went together easily, allowing me to focus my time on the little details. The pattern was easy to follow and a brilliant way to practice sewing techniques. I think this pattern would be a fantastic way to encourage new sewers and help them learn to love it. Being able to put so many difderent fabrics to use made my inner fabric hoarder so happy. I was able to use scraps from past projects and I even parted with a rare Tula Pink racoon. This has got to be the funnest sewing project I’ve ever undertaken but it was also a lot more work than I anticipated. Your imagination can really run wild with this one. Rebecca Page gives you the foundations but the add ons you can put together yourself are endless! This is such a gorgeous little pattern. I’d been wanting to make a quiet book for sometime and this came along, perfect! My daughters 3 and 1 both love it. It’s a simple pattern but be warned there’s lots of fiddly cutting. The end result is worth it though. Can’t wait to make another! 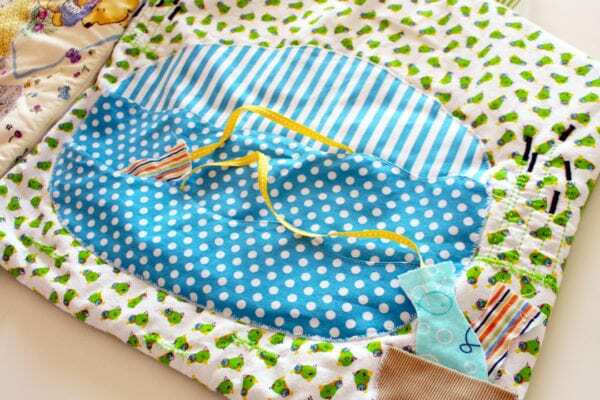 An enjoyable pattern to make and perfect for clearing fabric from the scrap pile! 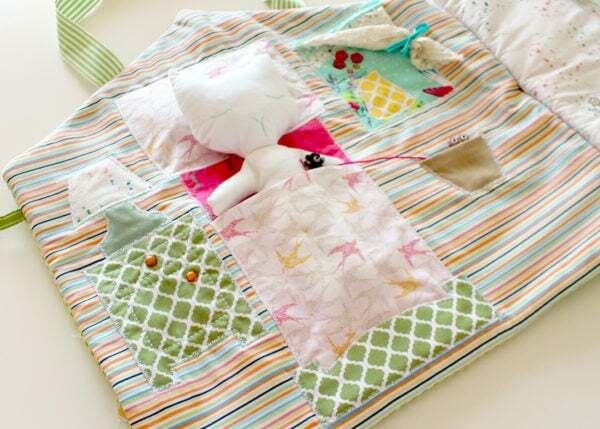 Nice and simple to sew up although a good amount of time is needed for choosing options and cutting all the little pieces so best not left as a last minute sew. I thoroughly enjoyed sewing up this beautiful book and my little girl is completely in love with her special birthday present! This is a wonderfully original pattern. While it does take more time than you would think to complete it is only because of the level of creativity in use. Each page is fully customizable to your taste and style. 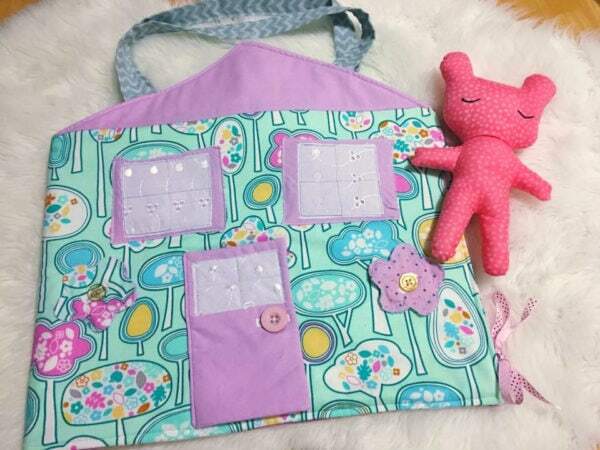 All of the page options are so cute it is almost impossible to limit yourself to the 4 page house and very easy to make an additional 4 page insert to use all the pattern pieces. You will be amazed at what your mind comes up with when you mix and match items. This is such a fun pattern! This was a lot of fun to make. My 10 year old loves it, but it will be going to my great nephew (2 yrs old) and great niece (5 months). It did take some time with all the little fiddly parts, but really no longer than a dress or shirt with a lot of details. I did the 3/8″ stitching as directed, but had considered a zig zag stitch to minimize fraying. Either would be good for the sewist. I’d like to add some more “rooms” or activity ages with more interactive pieces – opening door, velcro items, zippers, things to lace and tie, etc. This will be fun with the little stuffies to move them from room to room, encourage talking/vocabulary, recognizing colors, etc. 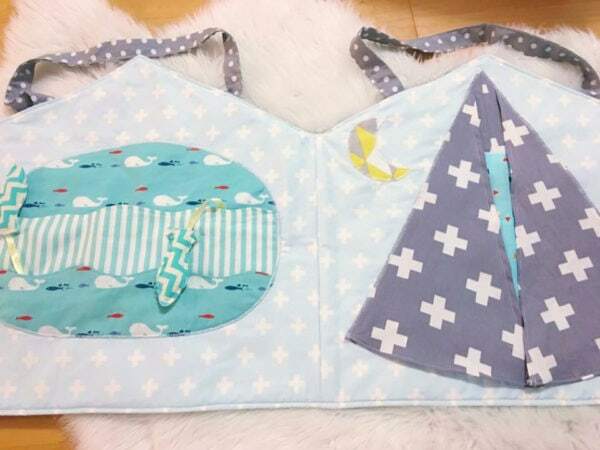 This sweet book quite easy to sew. The most difficult part is deciding what fabric to use. The instructions are clear and the pictures are helpful for a quick visual guide. I’m already making a second one! My boys enjoys the book everytime I take it out for them to play. Poor little Bubu Bear is already dirty from all the smooches he get from my little 15 month old. I will surely recommend this to anybody who wants to make something for their kids or as presents. 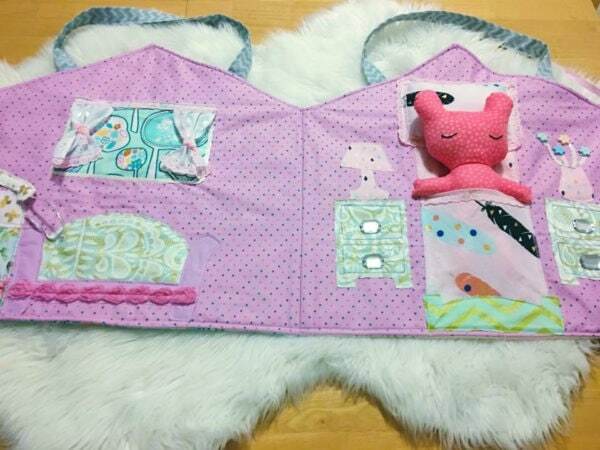 I sew daily for my children, and this quiet book has been what they appreciate most! They play with it constantly. I love it because it fosters imagination and can be used as a teaching took on so many levels. With this book, I can teach my children (ages 2 & 3) about shapes, colors, textures, directions, lines (parallel, horizontal, diagonal, etc). The book provides tons of fine motor movement activities as well as ample role playing fun! My kids LOVE to answer the phone and put their teddies to bed. Okay. I’m an adult. We don’t have little people. But we do have people come over with kids, and really…I couldn’t resist the little details and personalization that can be created with the Quiet Book. Essentially I made the book into our family’s life. And I love that it can be added onto easily now. The dolls are myself and Husband – I added pockets, and even made a super mini version of your infiniti scarf, as I like to wear them to keep my neck warm. Husband even has belt loops on the pants, and I have a lace sash. This has been a really personal project for me that is nowhere to being done – more stories will be added over time – all the benefit of the new add-a-page feature! This pattern was brilliant! 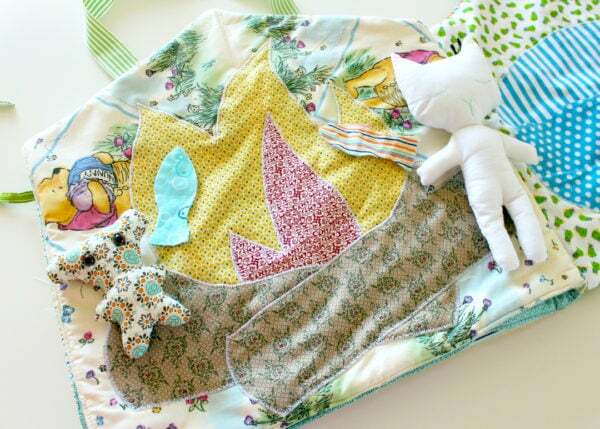 I had so much fun rummaging through my fabric to find bits and pieces to make my grand-daughter’s book magical! This is a fabulous pattern- so many options, so many stories to tell. It thoroughly lets your creative juices flow with a little guidance. The finished product was so popular everyone of every age wanted to play with it! 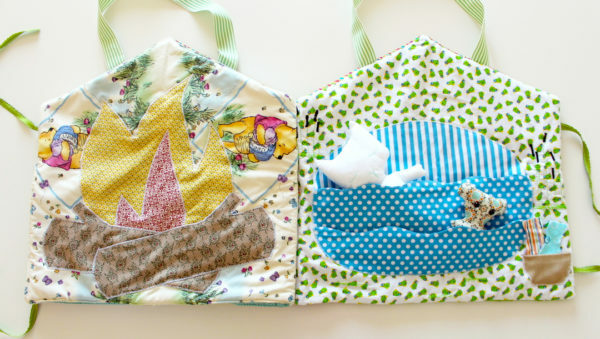 This is a must make for the toddler and kinder in the family.